Every year mobile and tablet friendly apps built to aid both designers and web developers with their work debut in hopes to succeed in the competitive app market. However, some of today’s developed apps are seemingly repetitive as they tend to focus on producing the same results just under a different name, interface and developer which might leave you yearning for something different. Luckily, every once in a while an app comes along that is not only refreshing from the multitude of replicas but also useful. Webnote, an iPad and iPad Mini app created by HopIn, launched back in the Appstore March 7th. The app is a cross between a mobile web-browser and a content cataloger that focuses on enlivening your digital content and dramatizing your visual designs. Think your favorite web-browser converging with Pinterest, but unlike Pinterest you can use images, videos, a selection of text and even gifs. What makes this app even better is that it’s easy to use as shown in the promotional video. check it out. So, what exactly is Webnote? Webnote by HopIn is the perfect solution for iPad users who tend to jump between different applications and browser apps like Chrome/Safari and their favorite social networks. It functions as an individual browser with intuitive gesture-based bookmarking technology and social networking features. Content captured can be maintained exclusively private to the user; or, shared via Twitter, Facebook, or among one’s HopIn contacts. You can create visual notes on top of website content by double tapping on an image, a video, or a piece of text, and it will automatically be saved to your profile. However employed, Webnote by HopIn cultivates the subtlety of small details while providing the rich utility of context. Personally, what is it that you think makes Webnote stand out from the competition? I think a core difference is that our competitors typically allow users to clip or save data from desktops, and consume them on their mobile devices. Webnote, on the other hand, is built with the insight that many will never have a desktop/laptop, and will need to clip web elements, such as video, text or images (not just an entire website/url) directly from their mobile devices. Hence, our product empowers a complete mobile experience, beyond just consumption. It has been built from the ground up to take advantage of gestures and the unique web browsing behaviors on these platforms. 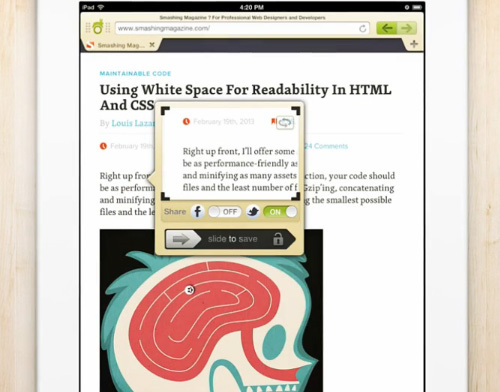 Webnote has a full built-in-browser that re-unites browsing and content saving in one app. The app is currently available only for the iPad and iPad mini, is there any chance of the app ever being available on other devices? We have noticed that the intent of usage between tablets and smartphones is fundamentally different. People have a more intimate relationship with their tablets. Typically, they use them when they have time to be inspired, creative or want to discover new content. In this sense, we would like to cover this usage intent by expanding into Android tablets. For smartphones, Webnote will be redesigned to reflect these different usage patterns, but for now, our focus is on the mobile tablet experience. I watched the video showcasing how the app works, is it really that simple to use? It really is, indeed, as simple as a quick double tap and a swipe. The UX of Webnote has always been one of our highest priorities and we think we’ve made great progress in creating an app that’s both visually stunning and absolutely easy to use at the same time. That’s what so special about Webnote’s tactile technology– with just one touch (or a double tap!) you can create an amazing archive of astounding digital content that 100% tailored to your personal interests. Though the app has just been launched, do you think Webnote has the chance to evolve as an app such as adding any new features? Of course. We have a very interesting pipeline of new features we plan to roll out. Having said that, our focus will always be on delivering an exceptional user experience and trying to provide an app that’s not only beautiful, but that feels fundamentally more intimate, by empowering users to capture the richness of details within websites. Webnote is truly first of its kind and hopefully won’t be the last. An easy to use and functional tool that can be used by anyone, no matter their preferences or occupation, the app is surely to succeed in the sea of apps or at least make a few waves. It really isn’t often enough that an app comes out with something completely different to offer. The innovation of such an app will hopefully be a precursor to future apps that choose to take on the task of merging content cataloging an everyday web browsing that is not only functional but user-friendly. As already commented on by HopIn’s CEO, the company plans to expand and work on future features to the iPad app and have not hesitated to do just that. The bookmarking app just recently integrated with Evernote as part of their new update. This update now allows you to connect directly to your Evernote account which will allow all those saved images and videos to be synced and backed up to your account with Evernote. You can also easily add tags to your growing collection to keep everything organized. Not only that but Andrés and the HopIn team have recently been named category winners for Best Technical Integration in this years Devcup 2013. That being said, I would like to wish both Andrés Godoy and HopIn all the best on their future endeavors. If you’re interested in finding out more information about Webnote by HopIn please visit www.hop.in.